Things have been so busy recently with all the events I have been doing as well as work, but things are calming down a bit. I have one major event this weekend and then I might get some time to myself for a while! As promised, here is one of my first interviews with one of the Open Studios artists who I met at Coughton a few weeks ago. Michala is a fantastic artist, and her work has inspired me to start painting again. The work I produced last weekend turned out very abstract- I think Paul Klee, Kandinsky and Miro were coming through a bit haha. I might even have a go at pastels this weekend too if I have time! 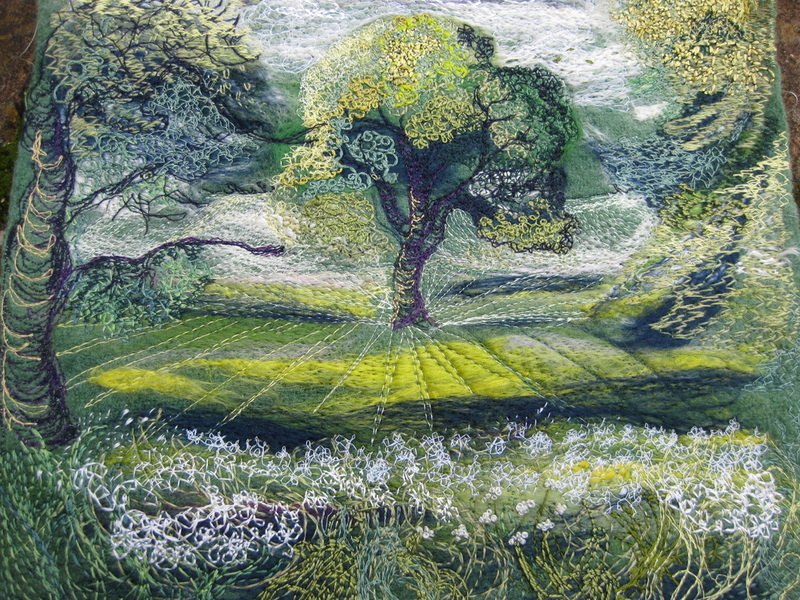 She has also invited me to see her studio, so I’m definitely going to try and visit as I really want to see some more of her textile work. So, here is my interview, enjoy! Firstly, could you tell me about yourself and how you came to be an artist? I think I have always been an artist, my earliest memories are of painting pictures for my parents and my play was always directed into creating things. When I left school I worked for Sandersons and then Laura Ashley in retail management. 8 years ago, to fit in with my children, I changed my career and started working as an art and design technician in a senior school. This led to me taking life drawing classes and working with the artist and sculptor George Wagstaffe. I started putting my work into various open exhibitions and I had work selected for the Leamington Spa Art Gallery, Rugby Art Gallery and The Herbert Art Gallery in Coventry. In 2011 I had a major exhibition entitled “Seas Of Grass” at The Herbert Art Gallery in Coventry and I have exhibited at the NEC in Birmingham. Since then I have had work featured in several publications and have had requests for commissions, talks and workshops. On your website you mention your recollections of your childhood, which have had a great influence on your work and when I met you, you spoke of different memories which have influenced you too. What are your strongest memories of your childhood which speak to you through your work? My childhood memories have influenced the way I work and the choice of materials I use. When I was 9 I lived in a small rural village on the borders of Northamptonshire and Warwickshire. The landscape was a magical, exciting place to play. I remember playing in the lanes that surrounded the village one day in the school Summer holidays and my friends and I were shocked to discover that all the trees had been cut down; their huge bodies lying side by side across the path. I remember the trees had been in full leaf and the tangled branches had become our secret dens over the holidays- it was an amazing place to play. Over several weeks when we returned to play and then discovered they were all gone, the landscape changed for ever. I will never forget how devastated I felt. Those trees were Elms who had succumbed to the deadly Dutch Elm disease. I have since found out that Warwickshire lost more Elms than any other County. I know I’m trying to bring that landscape back to life through my work. You are skilled in textiles and pastels, which I have seen first-hand. Which mediums of art do you feel the most comfortable working with and why? As a child I always played with things I found surrounding our village and garden, using stones, earth, plants etc. I had a fascination for wool which I collected off the barbed wire. I boiled up berries and onion skins to dye the fibres. I found a book on Medieval spinning, so I made my own spindle out of a large wooden knitting needle and a potato as a weight at the bottom! I spun the dyed wool and wove my spun threads together on a hand made loom. What is it about textiles that you love? Instinctively I like to work with threads, I love the feel of working with the different textures, I enjoy physically holding colours in my hands. Whatever materials I work with, paint, pastels or textile I still have the same philosophy behind my work. I’m obsessed with threads, they are like a drawn line waiting to be arranged together, they influence the way I draw and paint. Every piece of work is a journey, one piece leads to another. Stitching on blankets came about after a very stressful time in my life, I associate the material with comfort and protection. The need to stitch is also a source of well being, I find the rhythm of stitching calming and therapeutic. Which artists have influenced you and your work and why? There are so many artists that inspire and influence me, to name a few: Samuel Palmer for his magical, poetic view of landscape, Paul Nash as he saw trees as people as I do, Matisse for his rhythmical use of colour and form and Ivon Hitchens and his beautiful abstract landscapes. When I work on my larger pieces I use my whole body, exaggerating my mark making, so I find the American Abstract Expressionists fascinating. Poetry and music are also a huge influence on the way I observe landscape. Also, my friend and mentor, the artist George Wagstaffe for his encouragement, belief and understanding. Your techniques with both pastels and textiles are beautiful and unique. Could you explain a little about how you create your pieces? My work always begins with drawings, mainly in pastels out in the landscape. I will make many sketches, some progress into threads, my small circles. 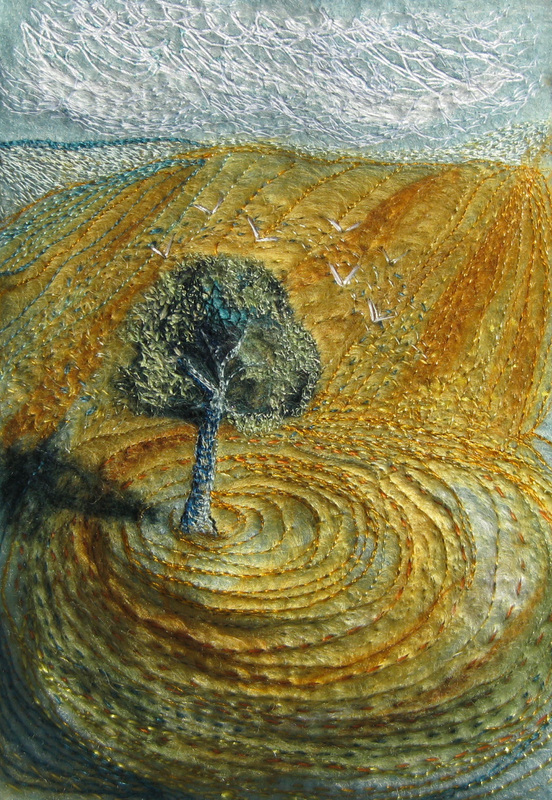 I use wool fibres, threads and fabrics with a combination of hand and machine embroidery. 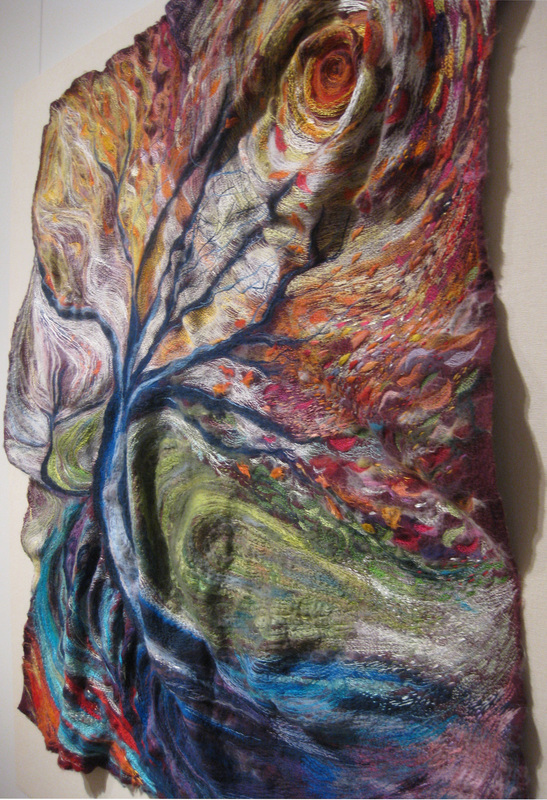 I manipulate the surface using the tension of my stitches, the wool becomes three dimensional and I then stitch my blankets onto canvas. Open Studios is a great chance for artists to showcase their work, such as the event at Coughton Court. Do you enjoy letting people see you working first hand and allowing visitors access to something so personal? I have recently become a studio artist at The Dawn Harris Gallery and Studios at Ragley Hall, not far from Stratford Upon Avon. This move will allow me to work on larger pieces and will be a great opportunity to share my work with others, having work permanently on show. I’m looking forward to spending time in the beautiful landscape which surrounds Ragley which will no doubt influence my work! During the next few weeks I’m participating in Warwickshire Open Studios, and I will be exhibiting my work with George Wagstaffe in his studios in Hawksmill Lane in Coventry. Where do you see yourself in the future? What new projects lie ahead on the horizon? At the moment I’m working towards my next exhibition with George Wagstaffe, which will be at the Micheal Heseltine Gallery at The Chenderit School in Middleton Cheaney near Banbury, January 2014. Thank you so much to Michala for letting me ask so many questions and taking the time to answer them for me. I love getting to know more about an artist and their work, and I shall be interviewing more artists soon.